Yes, there is a real 'possum hut: nestled in a woods beside a creek. It was built ten feet by twelve from twenty-four salvaged windows and discarded crate wood stamped with languages from three continents. Here was home for almost five years. Life consisted of the essentials: sleeping, eating, dreaming, reading, and staying warm. The first model was built as a gift and three dimensional invitation to a loved one. "This is where I live. Come visit." It became more. The scale used back then was two inches to the foot: the smallest real number that would accept commonly available hardware store sized nails. The surrounding walls and the paraphenalia of daily living served as plans. 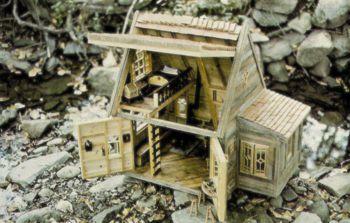 As much as possible, pieces of the real house were used to make the facsimile. Construction scraps were re-sawn into scale lumber. A window pane was removed and cut into twenty-four pieces. The table top became narrower by a board, the donated section becoming the miniature. Left over bits of material and some loose feathers from the patchwork quilt became a second quilt, identical but for size. The thinnest straws from the broom regrouped around a sliver of their own handle. The rug contributed a corner, the easy chair some upholstery from its bottom. Melted candle stubs became tiny dipped tapers. The handle of a wooden spoon was shortened, this piece providing an entire set of wooden spoons for the small house. Neither the pottery nor the stove was very cooperative about yielding parts of themselves, so their shapes were copied in wood and fired clay. The feeling of home emerged so strongly from this first model that recapturing this sentiment became the motive to build the second one. It was essentially the same, but the materials were not the scions of the original, and some of the particulars adopted new shapes. Details were included that were never in the real house, but would have been nice had they been: a few panes of colored glass, an outside door on the woodbox, some extra shelves, rockers on the chair. Since the building of the second house gave just as much pleasure as the first one did, another was begun. And then another; fifteen to date, about one every nine months. Each changes a bit from its predecessor. Structural materials now consist of available naturally colored boards. The number, locations, and shapes of the windows vary from house to house. The present rugs are loom woven, and the colored glass panes have evolved into tiny copper wrapped, soldered stained glass panels, some with as many as two hundred pieces. Cupboards come and go. The scale and the roof pitch are altered to fit a mood, and of course the quilts have different patterns and colors.